Lingering showers over the holiday weekend. 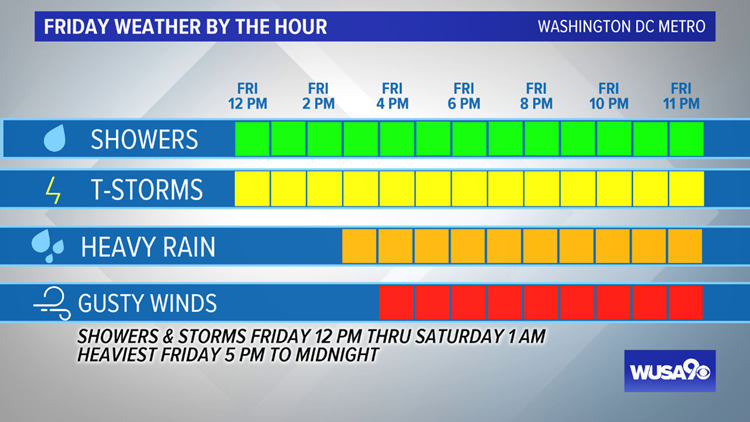 WASHINGTON — Storms return Friday, and some storms could be strong or severe with damaging winds and an isolated tornado. Storms will bring locally heavy rain, posing the risk of flash flooding Friday afternoon through Friday night. There is a Flash Flood Watch in effect Friday 12 PM to Saturday 5 AM. 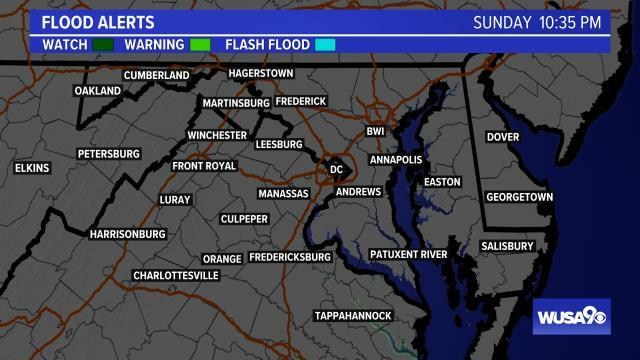 App users click here to see flood alerts. Thursday Night: Partly to mostly cloudy, windy & warm. Isolated late shower. Low: 65. Friday: Mostly Cloudy, windy & warm with isolated AM showers & PM T-Storms, Some Heavy/Strong. High: 75. Friday Night: Mostly cloudy, Windy & Warm with more T-Storms, Some Heavy/Severe early. Low: 62. Saturday: Partly sunny, breezy & cooler with mainly AM showers. High: 72. Easter Sunday: Mostly cloudy, breezy & cooler with more showers. High: 67. If you are a fan of warmer weather, then Thursday is your pick of the week with highs around 80. A passing shower is possible early Thursday. Active weather returns Friday and there is the potential for severe storms and flash flooding. Stay Weather Aware Friday into Friday night. Review your severe weather plan and have a way to get warnings. 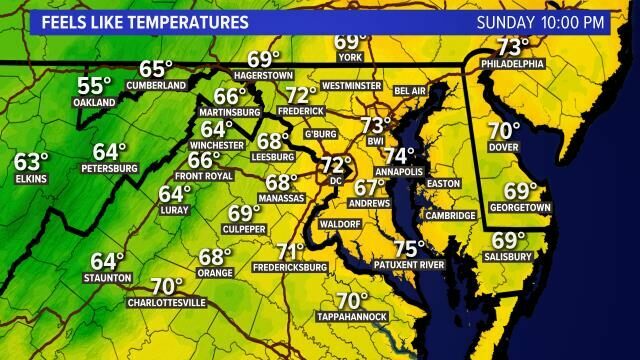 You can download the WUSA 9 App for free on your smart phone or sign up for Weather Call. 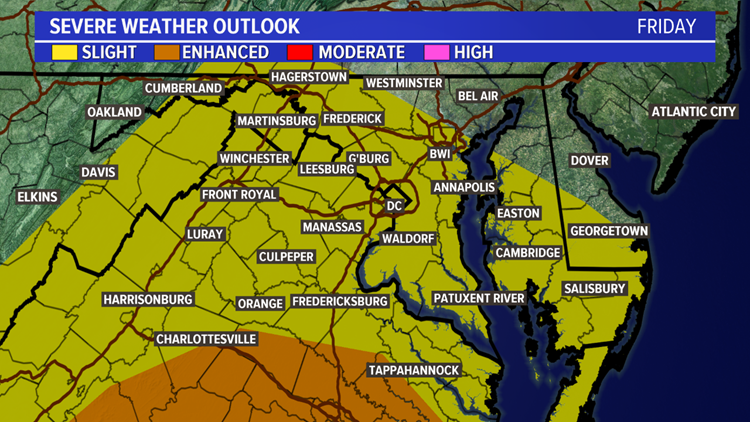 The Storm Prediction Center has placed the entire DC area in a 'Slight' Risk of Severe Weather -- meaning the atmosphere will be primed and the ingredients are there for strong and severe thunderstorms. The primary severe weather threat will be damaging straight-line winds that could be in excess of 60 mph. In addition, there is enough wind energy and spin in the atmosphere for an isolated tornado, especially in the afternoon through mid-evening. 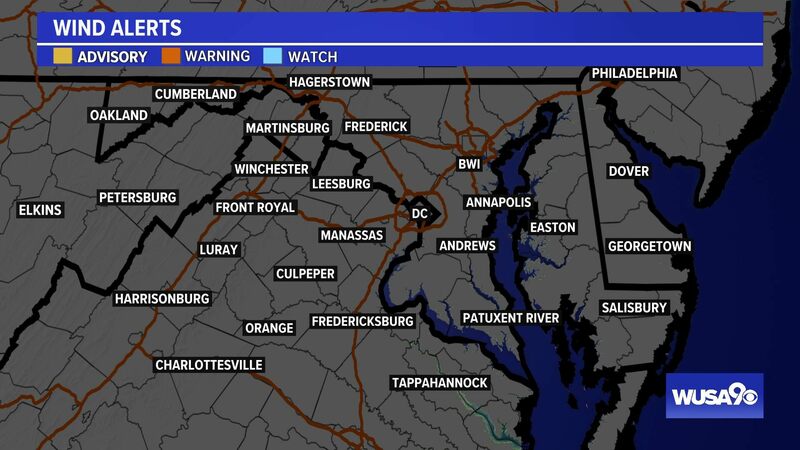 Primary time frame for storms is from Friday 12 p.m. to Saturday 1 a.m. To narrow it down more, D.C. is most likely to see stronger storms between 5 p.m. and 12 a.m.
Futurecast shows scattered to numerous storms throughout Friday afternoon and early evening. They'll come in waves. And each new storm poses the threat of damaging winds, heavy downpours, and perhaps a brief tornado. A larger squall line of storms will move through early Friday night, bringing the threat of additional damaging winds and heavy rain. App users click here to see Futurecast. Recapping the timing for DC, expect spotty morning showers but numerous showers and storms in the afternoon through early Friday night. 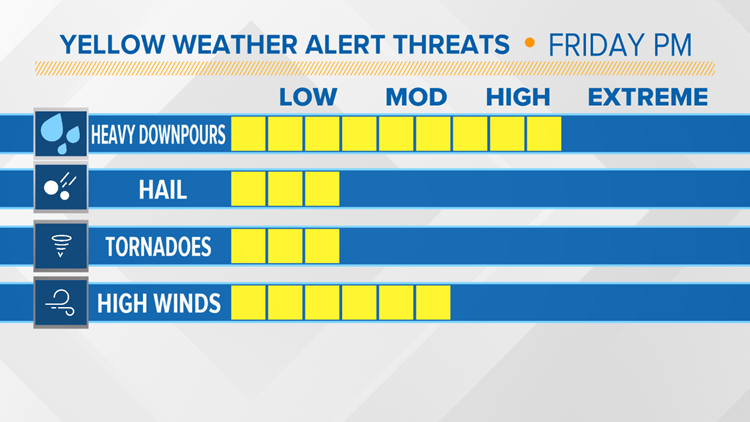 Heavy rain and stronger storms become a bigger threat from mid-afternoon onward. Past Friday's storm threat, an upper-level low passes overhead this weekend, keeping cooler temps and occasional light showers in the forecast through Easter Sunday. Showers will linger Easter weekend as an upper-level low passes overhead Saturday night into Sunday. 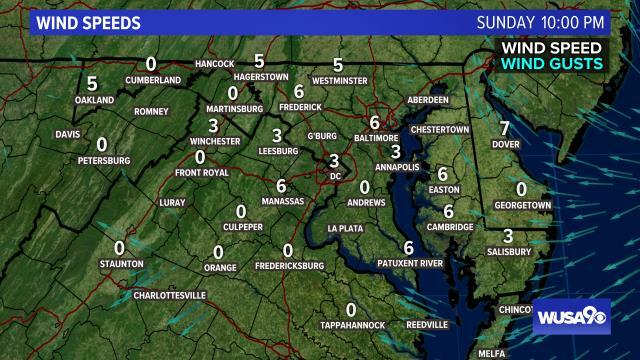 This will keep extra clouds in place and cooler temps. As of Thursday afternoon, the bulk of the showers seem to be more of a factor early Easter Sunday, rather than Saturday. Thursday Night: Partly to mostly cloudy, windy & warm. Isolated late shower. Lows: 60 - 65. Winds: S 10 - 20. Friday Morning: Mostly cloudy, windy & warm with some showers, mainly west. 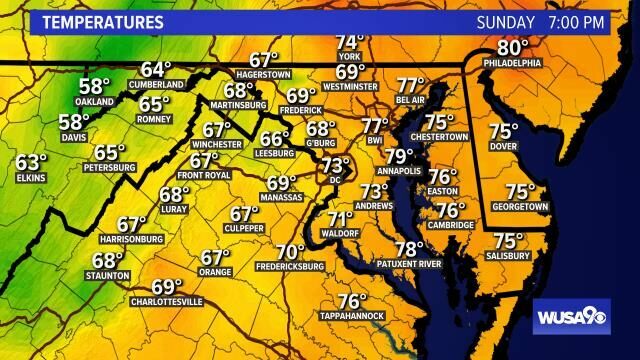 Temps: 60s/70s. Winds: S 10 - 20+. Friday Afternoon: Cloudy, windy & warm with T-Storms, Some Heavy/Strong. Highs: 73 - 78. Winds: S 10 - 20+. Friday Night: Mostly cloudy, Windy & Warm with more T-Storms, Some Heavy/Severe early. Lows: Low 60s. Saturday: Partly sunny, breezy & cooler with mainly AM showers. Highs: 68 - 73. Winds: S 10 - 15+. Easter Sunday: Mostly cloudy, breezy & cooler with more showers. Highs: 64 - 69. Winds: SW 10 - 15. Next week starts quiet Monday with seasonable temps on either side of 70. A few more storms return Tuesday. Monday: Partly cloudy and seasonably mild. Highs in the low 70s. Tuesday: Partly cloudy to mostly cloudy with some PM showers & t-storms. Highs in the mid 70s. Wednesday: Partly cloudy and cooler. Highs around 70.